The professional dog walkers at Pet Sitters Ireland have years of experience walking dogs and, just as important, love dogs as much as you do. Do you offer dog training? How can you help ensure our dog succeeds at his dog training? Those are just a few of the questions we hear from prospective clients of Pet Sitters Ireland. Successful training means consistent practice and repeating the same commands over and over. Your professional pet sitter from Pet Sitters Ireland will talk with you to learn the commands your dog is working on and will use those commands each day during their walk. Show your professional dog walker the dog training techniques you and your dog are learning. She can then add those training techniques into her daily walk with your dog. Maybe your dog is learning how to heel. Your dog walker will practice the technique your dog trainer has taught you and your dog. Consistency is essential when training your dog. Missing a few days here and there might not seem like that big of a deal. But, if it happens often enough, your dog simply isn’t going to retain all that he has learned. Your professional dog walker will ensure your dog maintains his dog training routine as she practices with him during every dog walk. When you do something right or even wrong, do you prefer to receive positive or negative reinforcement? No one wants to hear what they’re doing wrong in a negative way. Your professional dog walker will use plenty of positive reinforcement with your dog, even if he’s done something wrong. 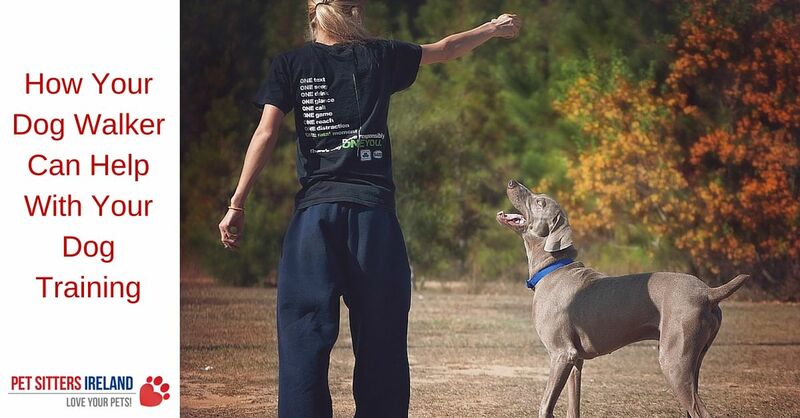 We understand that one of the keys to successful training is keeping your dog encouraged and in good spirits. Our goal is to ensure your dog’s mental and physical well-being and to ensure he has fun during his dog walks with one of our professional dog walkers. If you’re ready to give us a try or if you have any questions, please get in touch now. Call on Freephone: 1800 30 30 10 or 087 7453847 or email enquiries@petsittersireland.ie. Do you think a professional dog walker can help reinforce what your dog is learning in his dog training? Why or why not?